The Toronto Youth Wind Orchestra just celebrated their 25th anniversary… and by no means coincidental, another significant anniversary was happening this season too. That’s right, TYWO’s 25th anniversary celebration coincided with the 125th season of Carnegie Hall! With serendipity like that, TYWO of course decided they had no choice but to venture south across the border for what would be our 3rd performance at one of the most prestigious venues in the world. With a bus full of musicians barely containing their excitement, off we went! 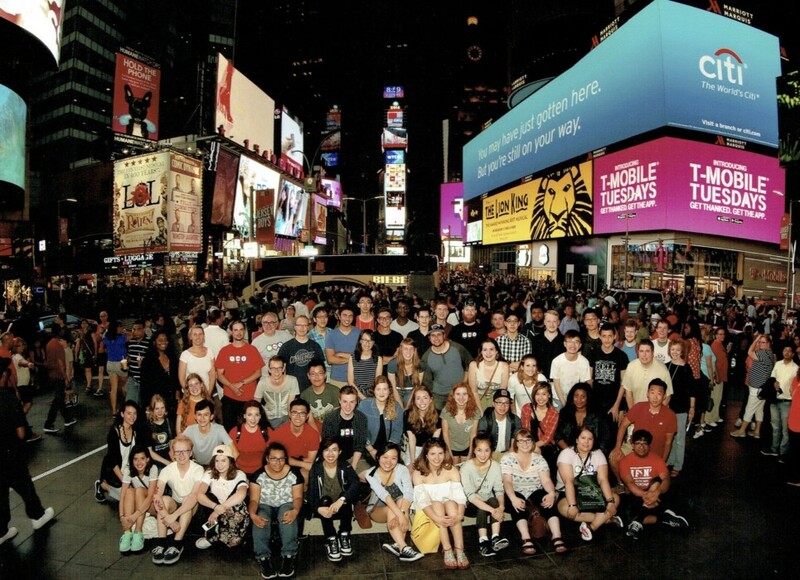 Arriving in Manhattan after the long drive to a wall of humidity, our first order of business was a group photo at Times Square – right down the street from our hotel and our venue of choice. Our first full day in the city that never sleeps, saw us embark on a bus tour of the city with bona fide New Yorker Brian, a rehearsal in the hotel ballroom, and then to round out the day – a performance of Stomp! We were all quite amused at how impressed the cast seemed when we repeated their rhythms in the call and response portions of the show. I wonder if the clued in to the fact that their entire balcony was filled with a group of musicians? For our second day in the big apple with headed north to Harlem for an outdoor performance at the Richard Rodgers Auditorium on the edge of Marcus Gervey Park. 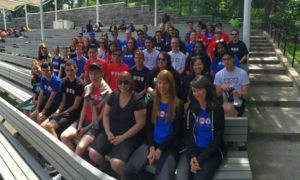 We were sharing the stage with other members of the New York International Sounds of summer Music Festival – including the Lynbrook High School Festival Band from San Jose, and the Academia Musical Da Capo from Puerto Rico. Our percussion section made some new friends when the joined the De Capo group for some salsa dancing in front of the stage! After some free time to explore the city, then we were off on an evening cruise around Manhattan as well as a spot of dinner, dancing and plenty of New York cityscape selfies! And then the day was finally here. We had awoken on the morning of our performance at Carnegie Hall! We entered through the backstage door, festival lanyards joyously swinging from our necks, and all held our collective breaths as we stepped out onto the stage for our dress rehearsal. Your author even started crying when we started to rehearse the trumpet solo in Point Pelee. It was finally here… 25 years of music making leading up to this moment. We took the stage to the cheers of our family and friends, who were beaming down on us from the balcony. The performance went by in a blur, but I can safely say that was by far our best ever performance. We blew the roof off with Newman’s Blow it Up, Start Again, had everyone Waltzing and Danzon-ing in their seats, brought the audience to tears with Howard Cable’s Point Pelee, and then closed the show with Alfred Reed’s El Camino Real – a show stopper if there ever was one! I’ll tell you – it didn’t feel quite real… but we had just performed at Carnegie Hall! As we let that sink in, visited the gift shop, and literally stopped traffic to get a group photo out the front of the hall, we only had one more ‘official’ event of the tour left – and that was our end of season banquet. We ate, we laughed, we cried and acknowledged some of the special people in our organization and then all went our separate ways to enjoy our last night in New York City. Goodbyes are always hard, and even harder when you’re trying to say goodbye to Manhattan and the Lincoln Tunnel is closed. Unfortunately, our journey home took a bit longer than expected due to the aforementioned tunnel closure (due to an overturned truck), but we made it back in one piece, a little weary, but all with that special feeling you get in your tummy when you’ve done something special as a group. 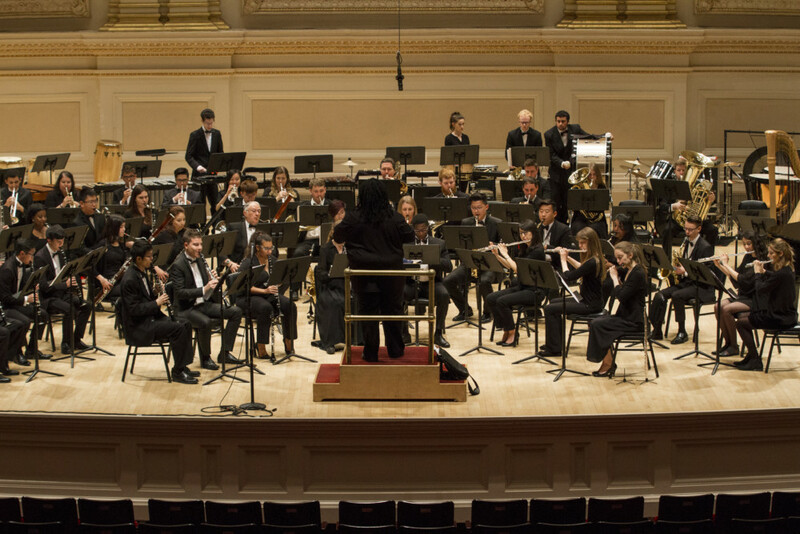 That was the end of our 25th anniversary season – an amazing performance at Carnegie Hall. Something none of us will ever forget. And Carnegie Hall? We’ll be back for you… just you wait!